This little beauty is a Morris 8 Tourer from A.B.S. Models. Another one of the range of Springside Bedford "O" series lorries - the cattle truck. A Foden S21 transporter with an International Harvester bullgrader load, all from Langley Miniature Models. Ah........isn't it cute? A 1957 1 ton electric milk float, from Langley again. This little creature is a 1950s Nash Metropolitan, which was an American design built by Austin at Longbridge and shipped back over to the States! 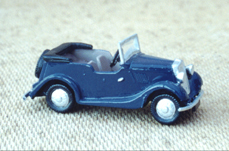 After a few years in production, with modifications and developements along the way, Austin obtained the rights to distribute them to the rest of the world, and many were seen on Britain's streets. This model was made from an R.Parker kit. 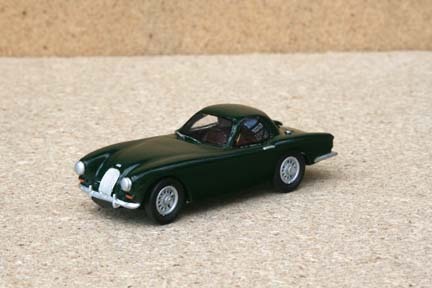 This stylish little beauty is a Morgan Plus 4 Plus - a 1/43 scale model (so suitable for an O-gauge layout), built from a T.W. Collection kit. Apparently after being launched in 1963, it simply didn't catch on with the Morgan-buying public, so only 26 were ever produced. For my birthday in 2017, my wife took me to the Morgan car factory in Malvern, where they had one of these on display - I wonder what happened to the other 25 !